Puzzlemad New Additions: It's ugly but really it's very very beautiful!!! It's ugly but really it's very very beautiful!!! My secret friend sends me puzzles quite regularly and keeps my humility at the forefront when he insists that I can solve certain puzzles and I really struggle. 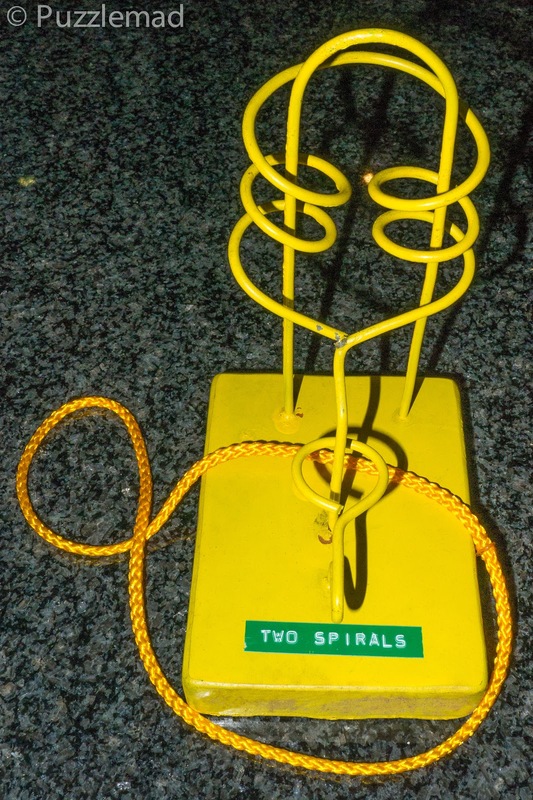 The above disentanglement is called two spirals (or dual spirals) for obvious reasons and the present Mrs S says it is ugly. She's right but the solution to it is far far from ugly - the Aha! moment is fantastic! I really struggled to reassemble it the second time around - it took me 2 hours!! Also there's almost no risk of knots whatsoever because of the beautifully elegant set of moves!!! If you can make one for yourself then definitely do so - it is fab. Louis, I'm bringing this to an MPP for you soon!